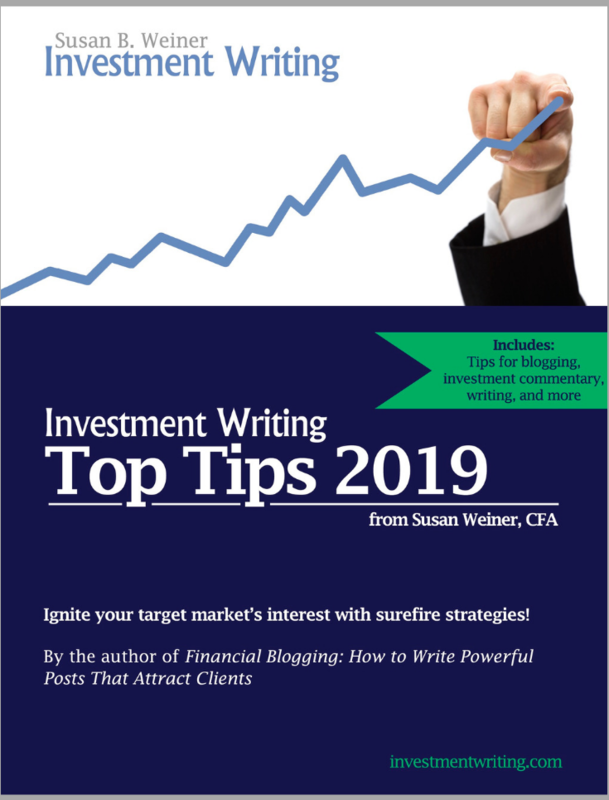 Get your PDF copy of Investment Writing Top Tips 2019 FREE when you subscribe to my newsletter. Buy the Kindle version of the 2018 edition for only 99 cents! Want to benefit from tips in the earlier editions of Investment Writing Top Tips? To buy earlier editions, email me. Susan provides solid tips investment writers can use today to break through the chatter and effectively reach their target audience. If you’re trying to promote your firm or yourself through social media, this is a great resource. I like this so much I sent it to my management team. This collection is a treasure trove of the best of Susan’s best—a must-read for investment professionals who care about clear, effective communications. In the age of social media, being able to convey your insights through words is essential to building influence. If you want to learn to become a better writer, there are some wonderful nuggets of writing wisdom in Susan’s report!